Really a tiny missile capable of identifying and following a person. In the film, Jack Ramsay of the Runaway squad chases after malfunctioning robots. 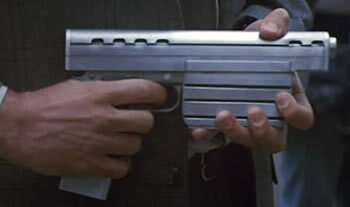 However, evil mastermind Charles Luther has an advanced weapon prototype - a gun that shoots smart bullets. "Jack, look at this. The back half is all solid propellant. Valves for directional control ... look, it's all electronic." "You've heard of a bullet that has your name on it. Well, this one really does. And you can program it to go after a specific person." "I don't know, man. I've tried everything..."
"It's a heat seeking missile... Everyone's body has a unique heat pattern...This is your body's heat pattern and this is mine." From Runaway, by Michael Crichton. Here's the oversized gun that fires the smart bullet. The final feature of the device is that it targets individual people by looking at their body heat signature. Compare to the roving bombs from Manly Wade Wellman's 1941 story The Lost Rocket.